1. What time period/dynasty can it belong to? 2. Is this a bamboo motif, and is that common? I am not finding similar ones anywhere. 3. Why is the cup marked with red stamps on the side of it? Is that typical? Would it more likely be that the painter added them? 4. Any possibility to read what the signs say? Are they in chinese? 5. What is the purpose of this cup? Is this a tea cup? food bowl? or incense burner? 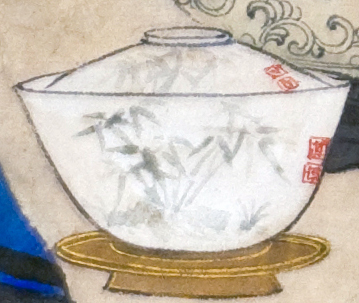 The painter may have been imitating a Japanese woodblock print (or more than one in combination) and could have used a lot of imagination in decorating the rice bowl. 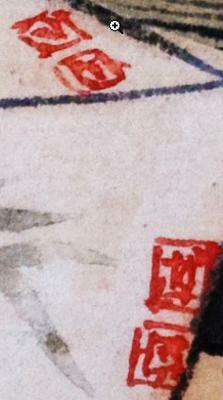 The painter may not have understood anything about stamped seals or about painting styles used on ceramics. You cannot answer these questions from a painting. All I can tell you is that the bamboo decoration looks more Japanese.